NEW ZEALAND PROPERTY INVESTORS have much to learn from those in other countries where governments have already established state and social housing investment models. With a portfolio of around 800 properties, Kevin Green (keynote speaker at the NZ Property Investors Federation conference last year) is the UK’s biggest private residential investor. Of those 800-odd properties, nearly a third are in social housing, mainly in South Wales, South Scotland and Northern Ireland. But social housing is different in the UK. The government there looked to private sector landlords for the capital cost of buildings but they provided the lease arrangements. Says Green: “We hold the buildings but the government has a long lease with local councils, either directly through the council or through private, non-profit-making housing associations. It works well for the government because they don’t have to outlay the capital costs – everybody wins. “The government provides housing free-of-charge to tenants – only to those at their wits end,” Green says. “They have to stick to certain conditions; for example, they have to get part-time work, otherwise support stops. But we don’t have to worry because the government sorts out payment and the eviction. Rent is paid direct to us. That’s very important.” To provide social housing accommodation to housing associations, private property investors must become registered social landlords. They must have spent two years working with housing officers doing mandatory training to become licensed. As a result, landlords get good access to great systems. 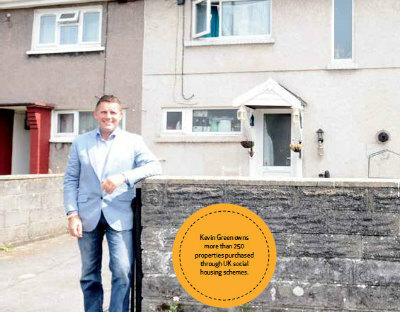 To find out about more about Kevin Green and his portfolio of around 800 properties click here to get the digital issue. Subscribe to the magazine for great stories like this delivered to your doorstep every month.